During our quest to conquer every State Historical Marker we decided we wanted to be the center of attention ... literally. Bagging the markers of Lander and Eureka Counties in 2008 allowed for a quick diversion off of US 50 in search of the exact geographic center of Nevada! There is a following of people who have left their tally at "the Center," and for us, our visit was no less a celebration. After a hearty meal in Austin, we headed east on "America's Loneliest Road" for 26 miles. At Mile 10 from Austin, the highway crosses the Big Smoky Valley then skirts the Monitor Range at another 8 miles before cutting an arrow-straight path into the Monitor Valley. At Mile 26, we sighted a sign on the right reading "Belmont." This my friends is the way to Nevada's Geographical Center. Keep in mind that despite its simple access the geographical center is not marked. 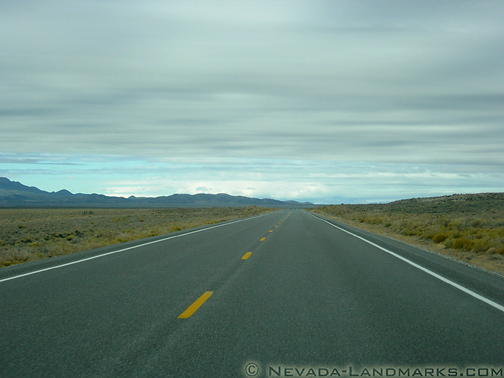 Most maps of Nevada do not mark the Center accordingly, but it's located in the northern part of Monitor Valley about 18 miles south of US 50. Others who have been to here have recorded its location with these GPS coordinates -- N39 19' 15.0" W116 38' 18.9]. Of course, in a society that fine tunes right from left such is the case with almost all of the 50 states' geographical centers. Many people have debated these coordinates while others worship them religiously. I don't agree with either and instead, The habit over the years has been to continually record new coordinates to "the center." What are we trying to improve on and most imporantly, why? As you'll see in a minute, GPS might be an unreliable resource for finding the Center anyway. The BLM and Forest Service have also included their own set of GPS coordinates so who's to say the digits are or aren't right? Which way is left from right again? During a revisit in 2011 we were delighted to see a handmade sign marking this important place. Most people I've talked to have claimed that the 72-mile Belmont Road is strictly "four wheel drive". (I've found that most of the time here "four wheel drive" is an undefinitive and relative term in Nevada.) If that's so, I'd like to know what kind of road they've been driving! The Belmont Road (also known as Old SR 82), is a delightful drive into the outback of central Nevada - easily, one of the finest backroads in the state. This wide gravel highway cuts down through Monitor Valley from US 50 to the mining camp of Belmont. 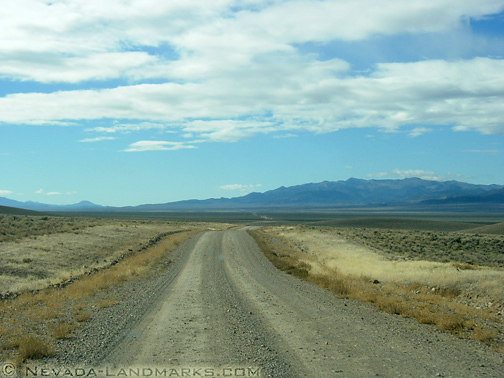 Many locals utilize this road as shortcut from Austin and Eureka to Tonopah. We were stuck with borrowing a friend's Prius for this trip so we were concerned with our buddy's wrath and what kind of conditions awaited us! I'm so used to my 2001 Tacoma that the notion of a mostly "all-pavement" vehicle concerned me. Again, the contrary is always a funny thing. Turns out a few cattle guards in, we found ourselves soaring down the valley at a comfortable 30mph. Of course, four-wheel-drive would be a necessary after a thunderstorm, during the muddy season, or during the winter months. As delightful an area this is, central Nevada is still no place to get stranded! "How do you define the precise geographical center in an irregularly wedge-shaped state like Nevada?" Here's your answer, my friends. Don't try. In a state like Nevada where nothing is ever based in stone, out here in the wilds these figures are just that - figures. Of course we could go into a whole speal about how latitudenal and longitudenal lines intersect similar to an algebraic X,Y graph. The point where these two coordinates meet on this imaginary graph is the state's center, a constant in these variables. Does your brain hurt yet? Here's a better idea. Just accept this little patch of earth into your open arms as the Geographic Center of our great state. In recent years, visitors have taken it upon themselves to mount a state flag here with a small coffee can to collect nickels (in honor of Nevada). At one time, quarters were thrown in as well ... but only on the condition they were Nevada-issued quarters! Unfortunately, we arrived a few years before this happened and ran into nothing that day. And that's just fine. That absolute nothing and complete silence took our breaths away as we took a few minutes to soak in the atmosphere. Just imagine inhaling crisp morning air and listening gleefully to the unbroken stillness of the desert. The sound of pure nothing! The middle of nowhere never seemed more beautiful.